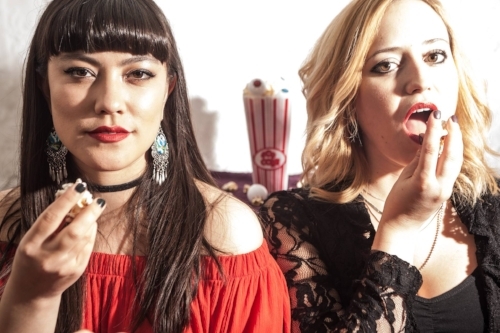 have been telling me about their latest single, Sugar Free, and what we can expect from their Pop the Bubble EP – they reveal some artists we need to get behind and talk about how they found one another. I wanted to know the sort of music they are driven by and whether there are gigs coming; why they think powerful duos are popular right now; the advice they would give artists emerging – they end the interview by each selecting a track. Bel: It was really hot and I’m feeling super-relaxed now! Jade: We are DOLLS; a Garage-Grunge-Rock duo (those seem to be genres we tick when people describe us). Tell me about the single, Sugar Free. What is the story behind the song? Jade: I came up with the guitar riff and Bel had a sugar-free drink. We were laughing about saying how people are so scared of sugar nowadays and how people get wrapped up with how everything looks in photos and the need to be validated. Bel: It’s also about how, if you didn’t take a photo of it and upload it on social media, it probably never happened. It is from the Pop the Bubble EP. Are there personal themes addressed? What sort of thing was influencing the songwriting on the E.P.? Jade: Mainly just our views on pop culture. Comments on what we saw around us and, basically, taking the piss. Bel: There are also some references to certain fictional characters…but we won’t give it away. If you read the lyrics closely you’ll probably work it out (winks). Was it cool working with Jim Sclavunos on the E.P.? What did he bring to the recordings? Jade: Yes. So good! He made us really think about the songs and how we played our parts. I think we became a much tighter band because of working with him. Bel: Completely agree! Jim was fantastic and pushed us to be our best. Also; it was my first time working with a producer who was also an (amazing) drummer, so it was a bit intimidating at first! How did DOLLS get together? When did you meet? Jade: We met via the Internet as I was looking for a female drummer at the time. Bel was living in Spain at the time and we got introduced by a mutual friend. We then got on like ‘a house on fire’ and we are still together almost four years later! Bel: Exactly! I kind of decided to move back to London partly because I was so excited to start playing with Jade! I am seeing a lot of powerhouse duos emerging right now. Do you think there is a reason for that?! Jade: It’s a lot easier organising two people than when you have three or four. Also, I feel like you have a really strong bond when there is only two of you. It’s a very intense relationship and you are around each other a lot! I mainly wanted DOLLS to be a duo because I loved the sound me and Bel created. I also felt like a third person might ruin our dynamic. Bel: I totally agree with Jade. It creates a certain dynamic that you just can’t quite get if you are part of a bigger band. Also, I believe that having ‘less resources’ (i.e. instruments, people and ideas) really pushes you to get very creative and think about playing your usual instrument in a very different way to what you’d normally do in a regular band. In terms of artists and music; what did you both grow up listening to? Jade: I grew up listening to Deep Purple, Led Zeppelin; Wes Montgomery, ABBA, Britney Spears…the list goes on and it is fairly eclectic. Bel: I grew up mostly on Slipknot, System of a Down; AC/DC, The Beatles; (The Rolling) Stones and cheesy '80s Rock and Glam-Rock… all sorts of that. Jade: Yep. We are working on that! We have our release show at Rough Trade East on 24th September. What could we expect in terms of your stage show? Is the stage somewhere you love being? Jade: Yes! Performing live is my favourite thing to do. In terms of what to expect…I don’t really know how to answer that…I guess you should come to a show! Bel: Absolutely! I always love performing. We have a couple of tricks we like doing onstage and we are planning something quite special for our launch show. I really didn’t like it when I first listened to it but then I saw them play it live and I was blown away. That album made me become a Nick Cave fan and, when I listen to it now, I can still feel the same feeling I felt when I saw them live. Bel: I think it could be The Beatles’ Rubber Soul or Toxicity by S.O.A.D. I know they are both completely different but both bring back so many memories of when I started playing drums. Jade: Not really. There’s a lot of great memories floating about in my head! Bel: There are lots of amazing memories and people I’ve met along the way…but I particularly love the times I meet other girls or women after one of our shows and they tell me I’ve inspired them to take up drumming lessons! I wish I had a female drummer role model in Spain when I was growing up! Jade: Nick Cave & the Bad Seeds or the Pixies. Bel: Haha. Yes. I’d love to support those bands! I’d ask for some Jack Daniels followed by prosecco (all to be drank after the show) and all the vegan junk food. Gracias. Jade: If you want to be a band for a while don’t get too sucked into what you think is trendy and current. Just make music you actually like and there will be people who like it too! Also, I would focus on making a really great single/E.P. before you even start doing gigs. It will help you get actual good gigs rather than the slog of playing to two people again and again. Bel: Mostly just don’t give up. It is so heartbreaking when I talk to older people that say they wish they had given their music career a good shot. Also; be proud of what you are doing. If you love the music you play it will show and people will see your enthusiasm. I currently love a band called Bully and Tired Lion from Australia. I also looove Curse of Lono. Jade: Not really. Everything I do involves music pretty much. If I was to unwind, I would watch a film with my boyfriend Sam or go out to eat! If anyone has any places they recommend let me know. Bel: I work in the pro-audio (work) daytime so, in a way, I do get to chill but it is also music-related in a way. My favourite hobbies are reading, dying my hair different colours and scuba diving - I obviously picked the wrong city for that! Bel: Valentine by Curse of Lono. Thanks!